We have just returned from a flying visit to Abu Dhabi to attend THE most beautiful of weddings. It was a wonderful treat and incredibly interesting to be part of the family’s celebrations and traditions, which are so very different to our own. Only women attend weddings there, apart from a brief appearance by the groom, and the word ‘elegant’ does not even begin to cover the whole occasion. It was a sensory wonder – everywhere we looked there was something beautiful and wonderful scents were wafted over the guests throughout the evening. We were greeted so warmly by everyone, as well as by the eleven pretty little flower girls who were wearing our dresses. The venue was enormous and heavily decorated with flowers hanging from the ceiling in vast cage-like sculptures, and each of the tables was laden with many more in gold bowls. There was a constant flow of dish after dish of delicious food and brightly coloured fruit cocktails and hot cinnamon drinks. The beautiful bride’s arrival completely silenced the 800 or so ladies there as we watched her make her way slowly and so serenely through the length of the venue. Her dress was gasp-inducing. We both felt incredibly honoured to be there and to witness such a special occasion. We had time before our flight home to pop in to see Zahra, our stockist in Abu Dhabi, at her shop called Trendy. It is always a delight to see her. 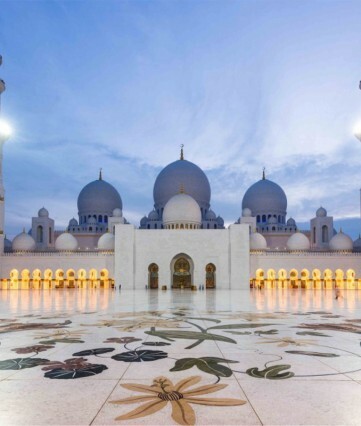 Then we visited the dramatic Grand Mosque and were amazed by the intricacy of the marble pillars and floors all of which were meticulously inlaid with semi-precious stones arranged in wonderful floral designs. We found it unexpectedly feminine and would love to be able to translate the inlays onto fabrics, but that might be easier said than done. Two totally unforgettable, glorious days! This entry was posted in Events & Shows, Real Weddings. Bookmark the permalink.